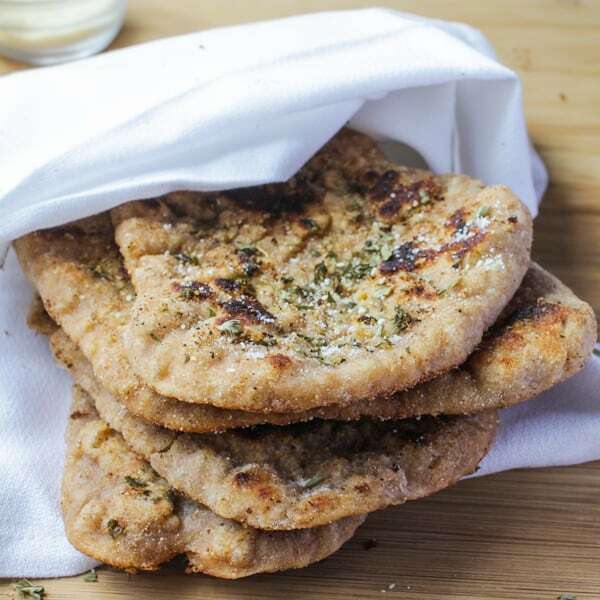 Enjoy the soft flaky crust and butter-y inside of homemade naan bread in a healthier version made with whole wheat flour! In case your wondering, I woke up super late on Saturday morning batting my eyes at the brightness why there wasn’t a Saturday post. Oops. But, I’d like to just say that this naan bread rocked my entire weekend. Soft, warm, fluffy, pull apart bread that was so well seasoned. 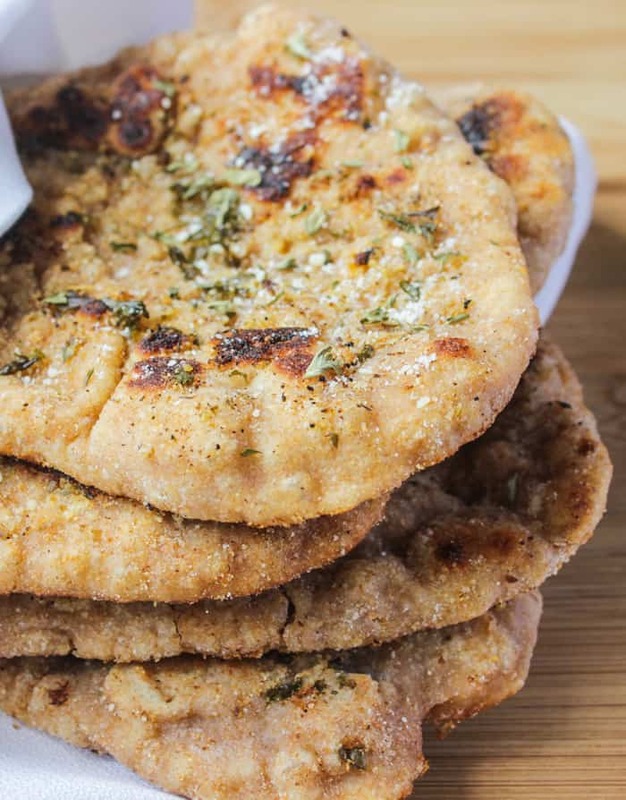 Can I get a whopping yes for Naan Bread?! I buy naan bread all of the time. Indian food and my family? Check. Several flavours of naan bread? Check. Naan bread finishing before the entire meal? Check. That’s because it’s insanely delicious. So when I realised that I could make this at home, in a pretty short time period and eat it super fresh AND seasoned how I want, I put down the laptop and ran, not walked, ran to the kitchen to experiment. I love that the whole wheat flour makes this a little bit chewier than normal but also makes it so much softer. The burned parts are so reminiscent of store-bought naan bread that and are my favourite part. 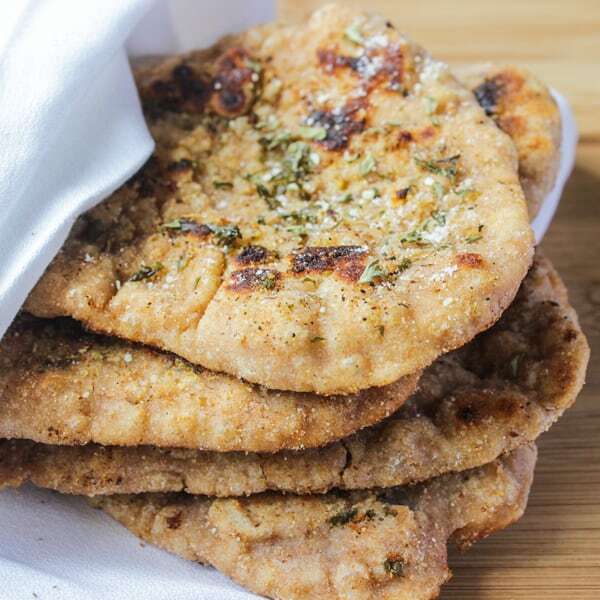 My favourite flavour is cheese naan bread, so I sprinkled some grated parmesan cheese and added all my favourite flavours of garlic, salt and pepper into each naan bread, then sprinkled extra garlic and cheese on top with a bit of coriander (I used parsley for some of them). I love how seasoned these were and how well they held seasonings. This plus homemade butter chicken is the making of a very delicious Indian dinner. Something I really need to put on regular rotation. In a bowl, add both flours, brown sugar, baking powder, nutritional yeast, garlic powder, salt and pepper. Whisk the ingredients together. Create a well in the centre of the flour. Slowly the warm milk and yogurt to the dry ingredients, and then mix together with a spatula until just incorporated. Flour your hands and knead the dough for about 5 minutes. The dough will be sticky. Cover the bowl with a plastic wrap and let it sit for 30 minutes on the counter. This will allow the dough to rest and become manageable before making the naan. Divide the dough into 6-8 balls (the smaller balls will puff up more) and roll into a circle. Press the dough down with your palm, then roll into a slightly oblong shape on a floured surface using a rolling pin. It should measure about 6-8 inches. Over medium-high heat, heat a cast iron skillet or a regular large skillet. Brush both sides of the naan with the coconut oil and here you can add even more seasonings on the outside of the naan. Add a teaspoon each per naan of coconut oil into the hot skillet, and add the naan. Cover with a lid and bake for about 30 seconds to 1 minute, until you see bubbles starting to form. They will puff up a little bit, but the indicator is the slightly darkened spots (you don't want everything to burn). Turn the naan over and cook for another 30 seconds to 1 minute on the other side, looking again for the slightly darkened spots. Sprinkle with vegan parmesan cheese, cilantro or parsley. Place on a wire rack to let the naan cool. Continue with the other naan breads until finished. I have substituted cold coconut cream for the greek yogurt and the milk for almond milk to make this recipe vegan. If using the cold coconut cream, add up to 2 tablespoons more almond milk. You can also use vegan parmesan cheese for the sprinkling. can you freeze the bread after it’s made? Yes! Just wrap it properly in saran wrap or in a freezer safe zipped plastic bag. Thanks Zainab! You need to! Jessica, I’m literally drooling over this bread. YES YES YES. Totally craving this for lunch today! pinned! 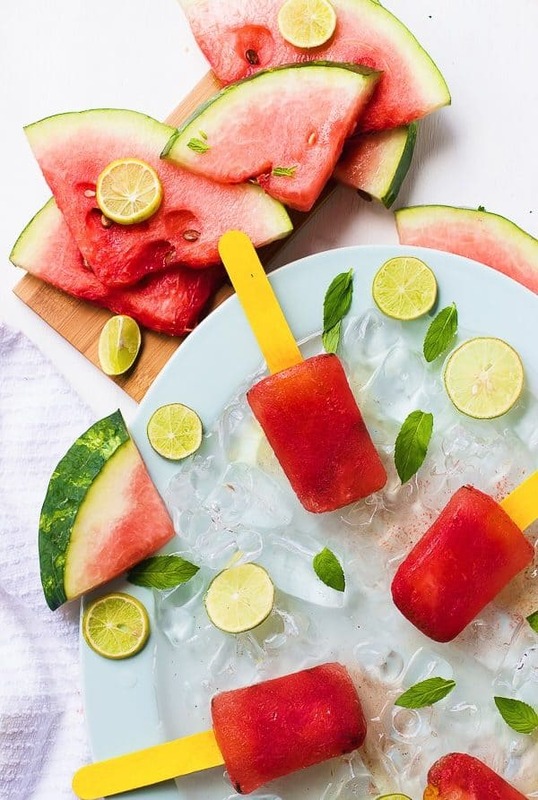 This looks soooo delicious! Did I go past the recipe, can’t see it? Hey Sophia, I JUST added it haha. And thanks so much!!! You’d like this – greek yogurt, whole wheat bread, and coconut oil instead of butter! You really made this sound soo good. It’s been years since I’ve tried naan. I have to get my hands onto more bread making. Oh gosh Natalie, YES it is! Thank you! You made homemade naan girl? Get out of here! This is so fantastic!!!!! And whole wheat too? Oh super NOM to this NAAN bread! It definitely looks flaky, soft and delicious! Thank you Kathy and you’re welcome! 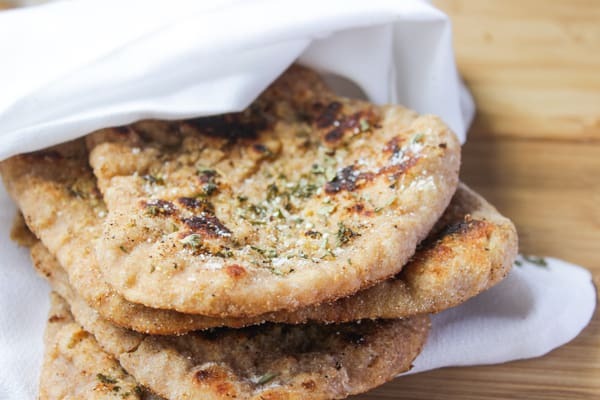 I love Naan bread so much, they are the sun on a rainy day for me! Definitely would like to make these soon! Thanks Alyssa! Haha I think I would do the same! Naan is my favorite! I basically want to eat it all the time. Love that this is whole wheat and topped with so much tastiness!! Thanks Allie and you’re welcome!! Naan is my absolute weakness. Everytime I’m around it, I try to refrain from eating more than 1 piece, but I always end up slathering butter on even more. I’ve never made naan myself (or any breads for that matter), but I’m pinning this so I can try it out for myself. It seriously looks so delicious! Aww thank you so much Graham, you’re very kind! Dang! That’s some gorgeous bread, Jessica! Really wish that I were not wheat sensitive…I love bread dearly. Seriously, I could dive into that third photo and just live there. Beautiful bread, my friend! Thanks for sharing and have a great rest of the week! Oh no! But thanks Stacy so much :). I know it’s late but I hope you had a great week. 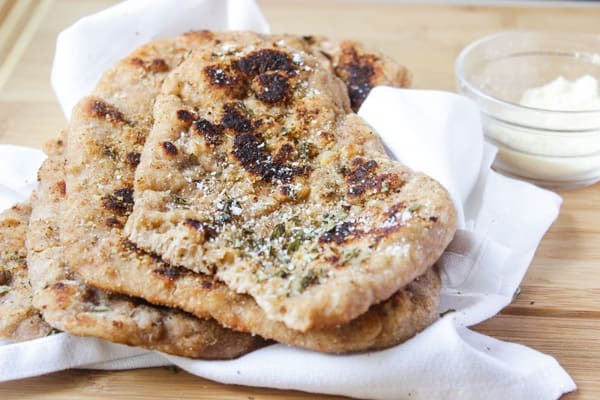 I love naan bread… but homemade!! Holy moly girl! This is absolutely amazing! YUM! girl! this looks like the best naan bread everrrr!!! 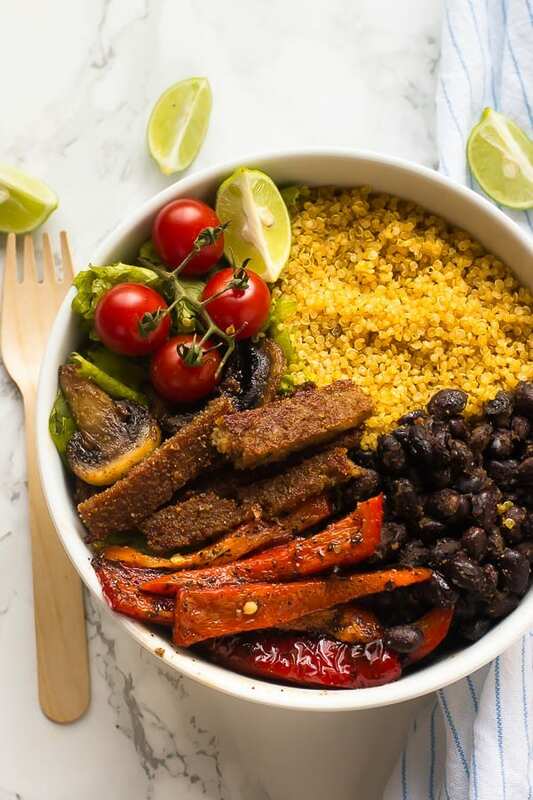 so flavorful, and the whole wheat makes it look even better! I LOVE naan! And these look just perfect! My mouth is watering just looking at that naan. It looks like it has just the right consistency, and that’s not easy to do! Definitely going to try to make this soon. 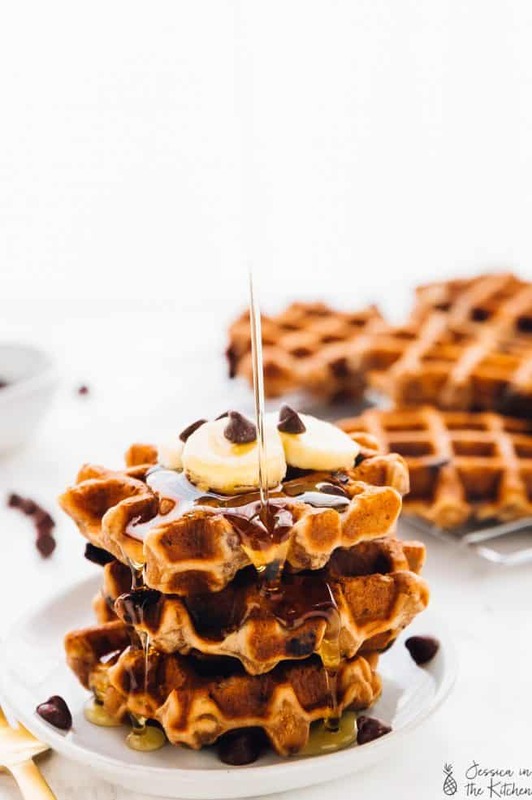 Super delicious Great recipe. Thanks for posting this up. The list of directions doesn’t mention sugar, did you intend sugar to be in this recipe. Thank you! I’ve included it properly in the recipe. Are you kidding? When I go out to an Indian restaurant, naan is the reason I always eat too much. Thanks for the recipe! You’re welcome Jeff! Yes, I go crazy for naan bread too! Thanks for letting me know! I just updated the recipe. Sorry about that, I’ve had some technical issues with recipes. It should be ⅓ cup. That should also say active yeast NOT nutritional yeast. I’ve fixed both! I hope you enjoy! Great! It seems I still had a few issues (so sorry about that!) So I’ve updated the recipe one last time! Good luck! Is it possible to list the carbs, protein, fat, sugar, etc? 161 calories in each, 27.2 g in carbs, 5.4 g protein, 3.5 g fat and 2.0 g sugar. Hope that helps! Are there alternatives to the Greek yogurt?? You could always use vegan yogurt. I’m not sure coconut cream would stand up. You’re SO welcome!! Thanks so much for letting me know. LOVE the garlic salt idea! I love this recipe, I make it about once a week and it doesn’t even seem to be enough. This recipe speaks to my soul. The only thing I struggle with is that the actual cooking is quite labour intensive – I was wondering if you had ever tried making them in the oven, and how that turned out? Haha no you don’t seem crazy at all!! I’m SO glad you’ve been enjoying this recipe so often and thank you so much for sharing! I have never tried making this in the oven but I plan to make a video for this post soon and I will try it out then and let you know. Madethis with some CurriedCoconut andsplit pea soup. Was wonderful. Thakns. This recipe is really quite simple tomake. Fast and easy, turned out great too. I made this yesterday and we loved it! I was a bit confused about the yeast – the recipe says “nutritional”, but your later comments say “active”. Like you, I tend to look at multiple recipes, then create my own custom recipe based on what sounds best. I’m an avid bread baker, so I opted to use active yeast and left out the baking powder (I was afraid they would be too biscuit-like). I used my own homemade whole milk yogurt and added an egg (from looking at other recipes). So it’s certainly not vegan, but we aren’t, either :). I also broiled it rather than frying, and brushed it with ghee when it came out of the oven. It was so delicious! Crispy outside, tender & chewy inside, and a lovely golden brown color. You can do so much with this recipe to modify seasonings and flavors. Thanks! So glad you enjoyed!! I’ll admit – this recipe is a BIT of a mess and something I intend to fix very soon! So happy you were able to decipher my original intention. I appreciate your feedback so much! Hi Terrym, could you please post exactly as you changed it? I am confused about the yeast options. please include baking instructions. With apologies in advance to Jessica for hijacking her recipe :)… Here it is. Create a well in the centre of the flour. Slowly add the warm milk, egg and yogurt to the dry ingredients, and then mix together with a spatula until just incorporated. Place on baking sheet under broiler set on low. Check after 30 seconds or so (I don’t recall exactly how long I left them in, it was a while back), but I took them out while they were lightly browned, but still pliable. Brush with the ghee, and add the cheese and/or herbs (I just used the parm). Hi Jessica, I recently found your page on IG and I’m in love … thank you for sharing. I see this recipe is from a 2014 post. I was wondering since you’ve become vegan have you revamped the recipe any . Can I substitute for the brown sugar or the all purpose white flour? So I’m just made this and it was awesome….I had to tweak it a bit though being short of some ingredients…I used wheat pancake mix and self rising flour….omitted the sugar since it was already a sweeter mix….and I invented my own greek yogurt out of 1/4 oz Greek cream cheese thinned out with milk to a yogurt consistency. I also used garlic salt instead of garlic powder and salt. Perfect pairing with an Indian chicken curry and rice dish I made for lunch. Thumbs up! Hi Shauna, Oh wow! Thanks for letting me know and so glad you enjoyed! Very interesting changes, love that you used what was in your house and still made a great dish.